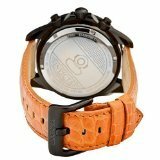 Gunmetal ion-plated stainless steel case with a orange alligator leather strap. Fixed gunmetal ion-plated bezel set with black spinels. 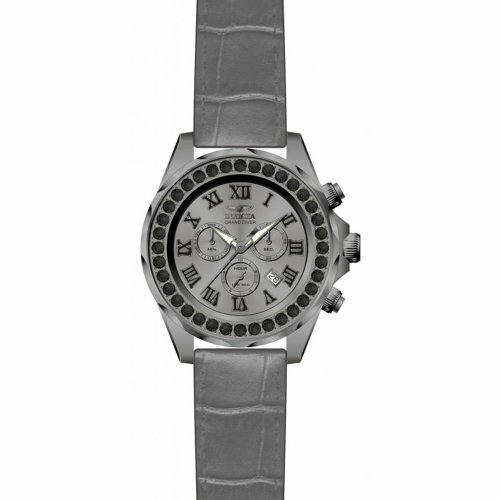 Black dial with silver-tone hands and Roman numeral hour markers. Dial Type: Analog. Luminescent hands and markers. Date display between 4 and 5 o'clock positions. Chronograph - three sub-dials displaying: 60 second, 30 minute and dual 10 hour / 1/10th of a second. Quartz movement. Scratch resistant mineral crystal. Screw down crown. Solid case back. Case diameter: 47 mm. Case thickness: 16 mm. Round case shape. Band width: 21 mm. Band length: 9.5 inches. Tang clasp. Water resistant at 30 meters / 100 feet. Functions: chronograph, date, hour, minute, second. Casual watch style. 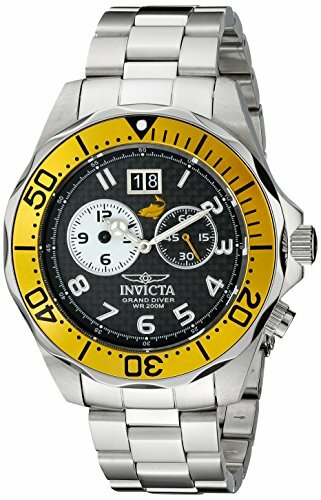 Invicta Grand Diver Chronograph Black Dial Orange Leather Mens Watch 14928. This wonderful timepiece from Invicta's Pro Diver Grand Diver collection is stylish, and versatile. 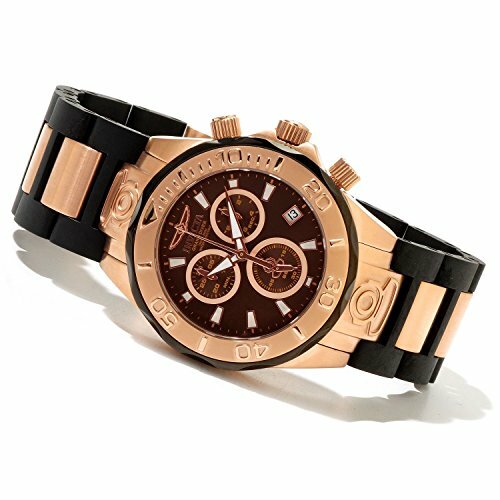 Its comfortable, exotic grey genuine alligator strap, striking rose-tone dial, unique black spinel encrusted bezel, precise chronograph complication, luxurious rose 18K gold plating and spectacular 300M water resistance capability makes this particular piece a must-have for any man's collection. Complete yours today. The Invicta makes a bold statement with its intricate detail and design, personifying a gallant structure. It's the fine art of making timepieces. This wonderful timepiece from Invicta's Pro Diver Grand Diver collection is stylish and versatile. Its comfortable, exotic yellow genuine alligator strap, calming black dial, unique black spinel encrusted bezel, precise chronograph complication and spectacular 300M water resistance capability makes this particular piece a must-have for any man's collection. Complete yours today. This wonderful timepiece from Invicta's Pro Diver Grand Diver collection is stylish, and versatile. Its comfortable, exotic red genuine alligator strap, calming black dial, unique black spinel encrusted bezel, precise chronograph complication and spectacular 300M water resistance capability makes this particular piece a must-have for any man's collection. Complete yours today. This wonderful timepiece from Invicta's Pro Diver Grand Diver collection is stylish and versatile. 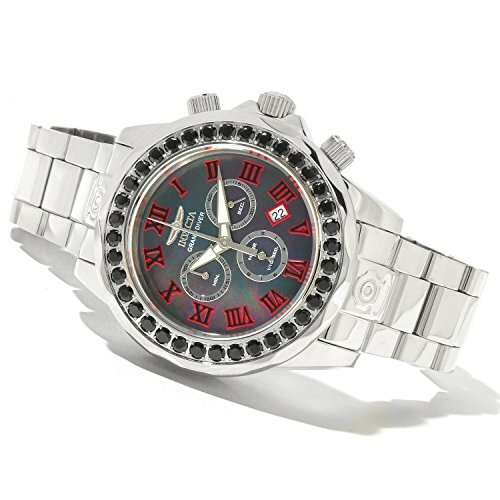 Its comfortable, exotic red genuine alligator strap, sleek silver-tone dial, unique black spinel encrusted bezel, precise chronograph complication and spectacular 300M water resistance capability makes this particular piece a must-have for any man's collection. Complete yours today.